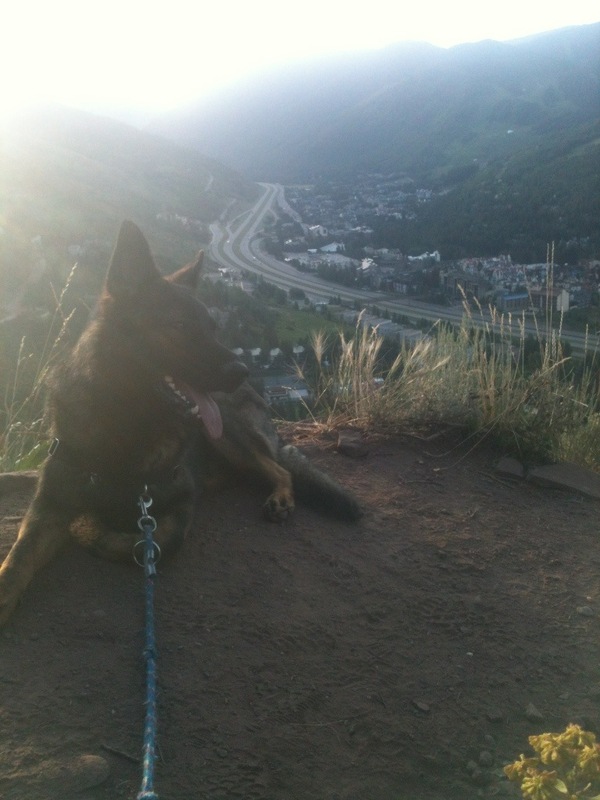 Good loop on the north trail with rooster. 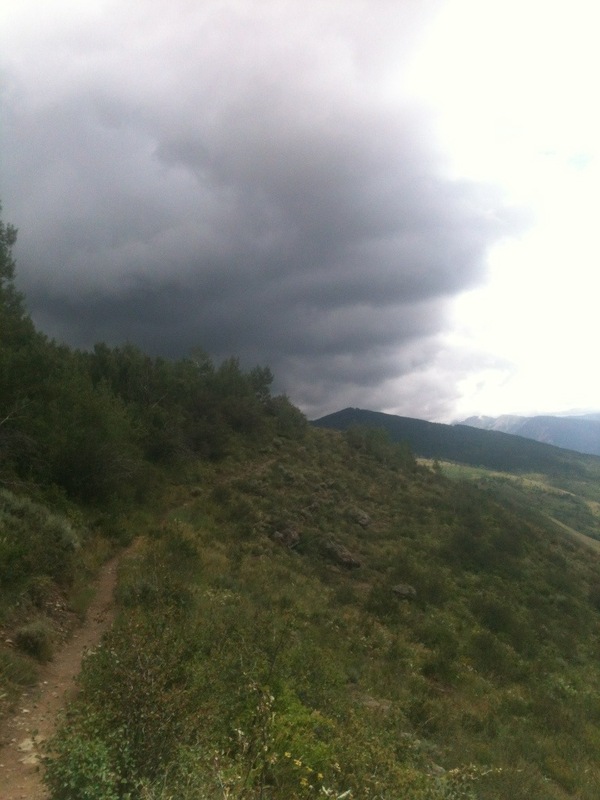 There were some dark clouds in the area but we went for it and ended up staying dry the whole run. I felt good and really like the new Pearl Izumis. 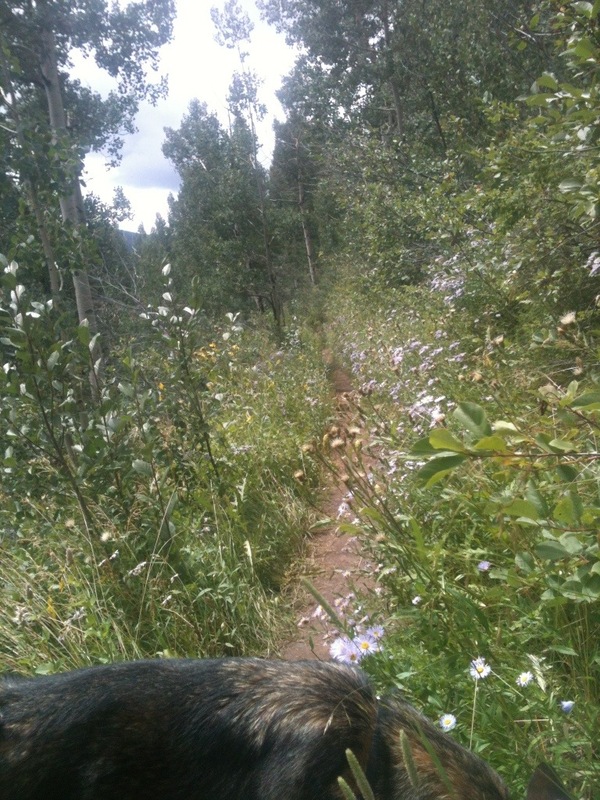 Saw a few hikers out on the trail but not too many, it really is a beautiful section of trail to have in my “backyard”. 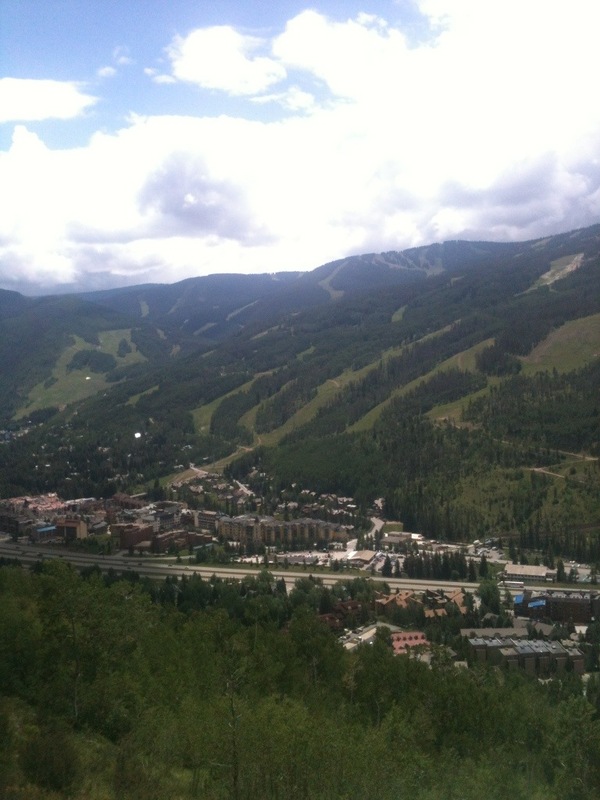 Solid three hour run on Vail Mountain. From my apartment in Sandstone I went though Lionshead Village and up git-a-long road to Liondown all the way up to Eagles Nest. 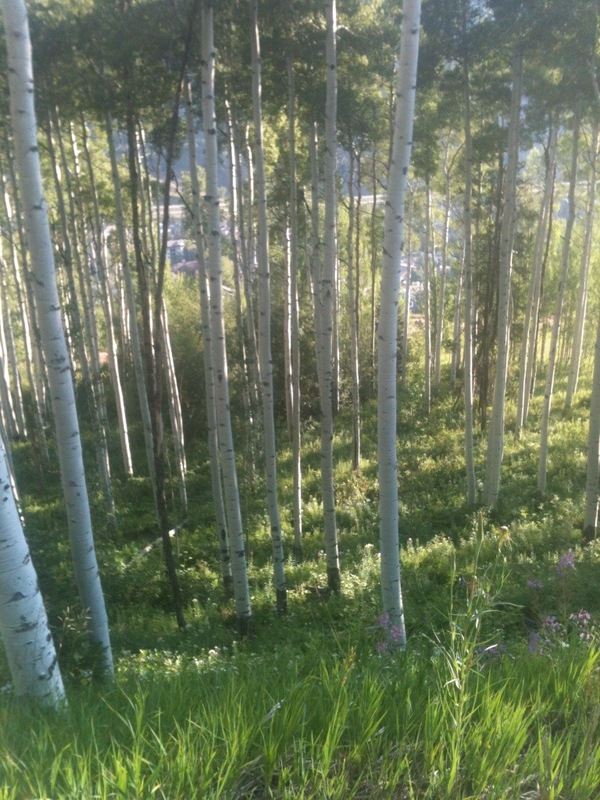 Its steady dirt service road just winding its way up the mountain through aspen groves. 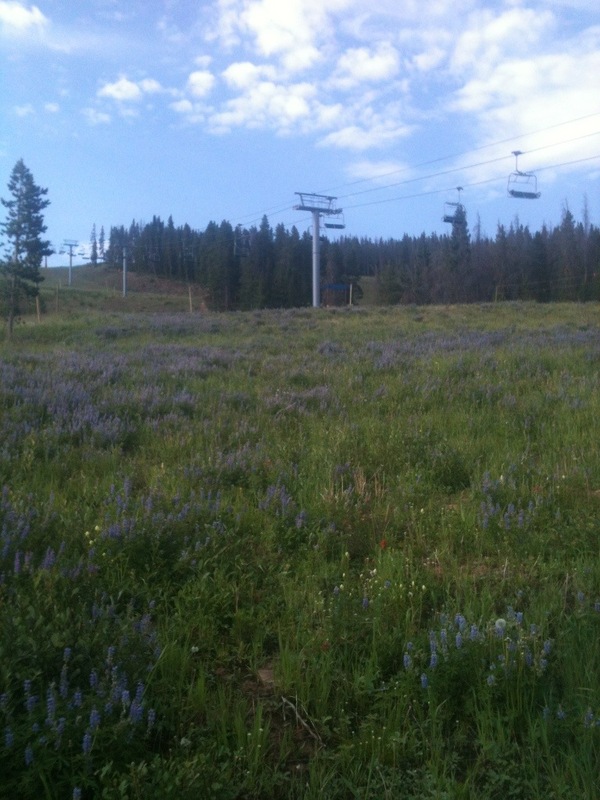 past chair lift towers and whistleing marmots. I was listening to the new Pretty Lights most of the way up and like it better every time I hear it. Towards the top I started mixing in some Grateful Dead, Phish, and Elliott Brood. 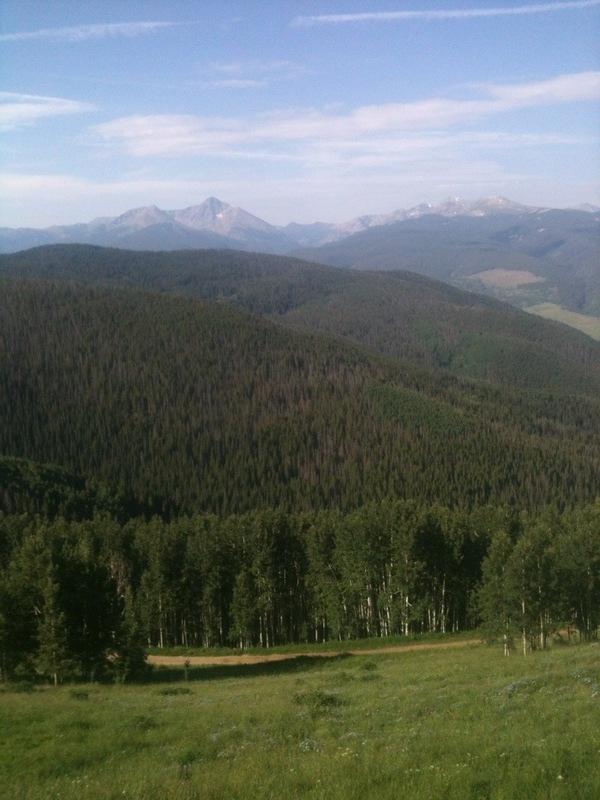 Rooster and I took in the view of Mt of the Holy Cross for a couple minutes then cruised Berry Picker all the way down. Going down Berry Picker was fast and technical with lots of rocks and roots. I ran into a few hikers and would stop and pull over trying to make Roo sit and practice good trail etiquette. At the bottom we both took a drunk in the river which is always awesome. 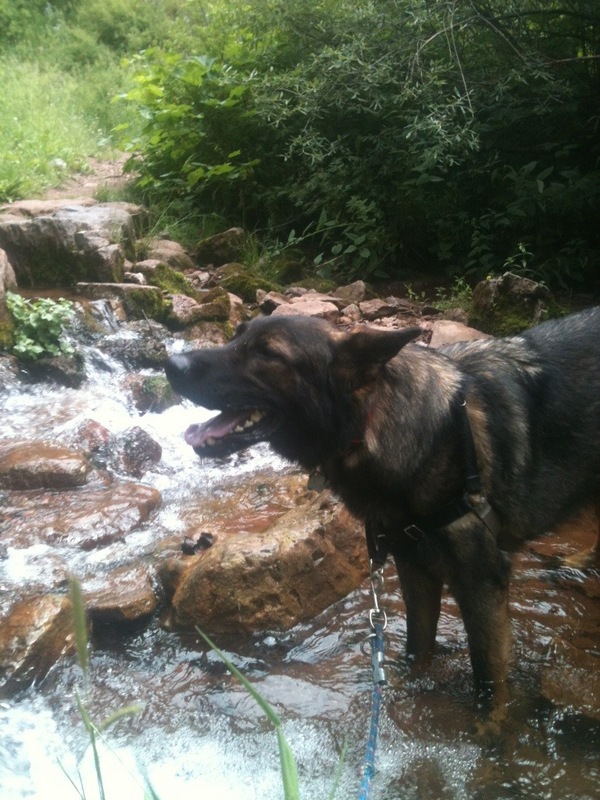 Chilled and soaking wet we ran the mile or so back to Sandstone. 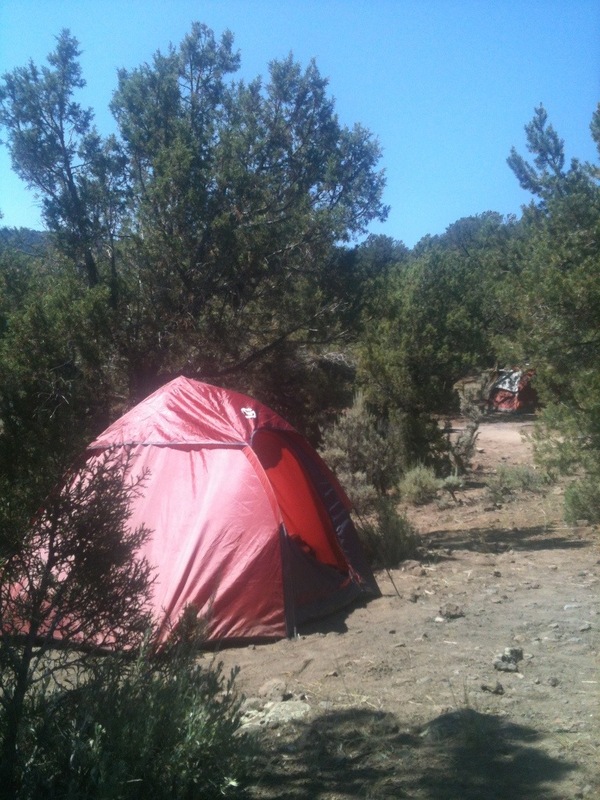 It was probably a little over 10 miles and felt really good for my last longish run before Mt Werner 50k next satuday. I wore my Scarpa Sparks and while I like them more these days, since they broke in, they are a little stiff and I look forward to wearing my new Pearl Izumis again. 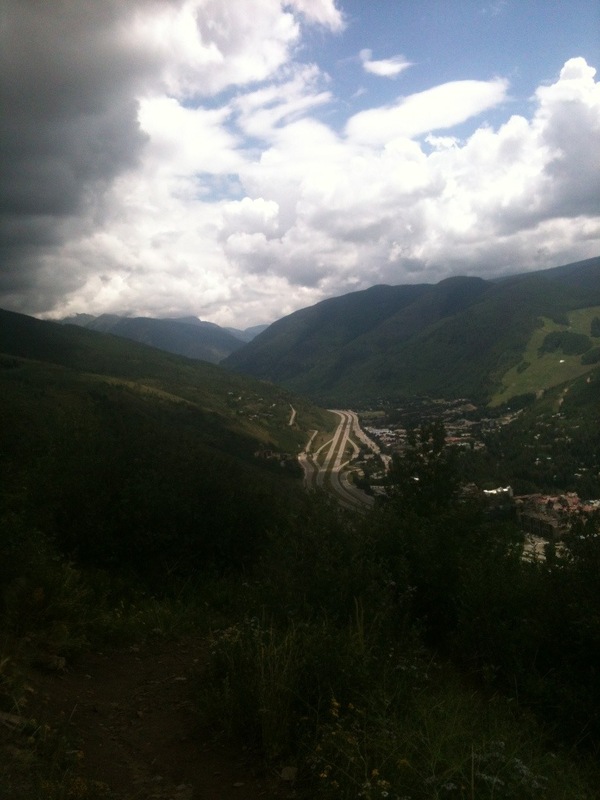 Was excited to get back with the Vail run club after a few weeks but the clouds were looking a little scary. I was starting to hear some thunder but decided to run over to Lionshead from Sandstone anyway and see who else likes to run in the rain. I found a couple of the usual members hanging out in a store front by the Gondola. We decided to head up the mountain towards the only non threatening clouds. I wore my La Sportiva Wildcats which are nice and light and good even when wet. I really like the soles on the wildcats, they are grippy, durable, and excellent trail shoes. Run clubs are funny when they start everyone is kind of just walking slowly chatting seeing who is going to start running first. Since i was already warmed up from running over I just took off goin up at a steady pace. When running alone its really at your own pace but running with others whether its a race of fun run you tend to want to stay with the group or get with the front of the pack. When trying to keep a steady pace there is this inner tug of war going on, trying to breathe, not stop running, deal with stomach issues, leg cramps, thinking about things from the day, life in general, and how beautiful the landscape is. This was all interupped by a sudden down pour, we turned around as a group, running for cover, I found a little shed with an over hang by forest road and gitalong road. About 10 runners and a mountain biker all huddled while light flashed all around us and heavy rain and hail came down for about 20 minutes. When it slowed down a little i peaked out and made the call the sprint for the village. As soon as we left cover it started pouring again. I love the feeling of running in the rain, things get very animal like, drenched and trying to avoid the puddles of this flash flood, trying to out run the storm. We made it back to lionshead and the rain pretty much stopped but, i decided to just run on home anyway. 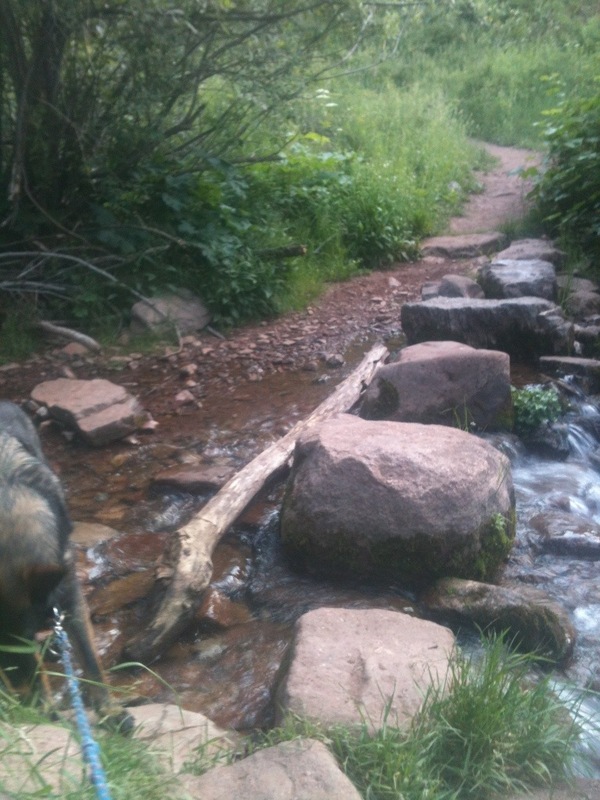 On the way back i cut through some back yards and found a little section of trail, not to be repetitive but running in the rain really does feel amazing, i think a big part of it is that Colorado doesnt see enough rain so when it get it, its something special. I have also been tapering for my 50k race so trying not to over do it and keeping the milage light means whenever I get a chance to run, I eat it up. 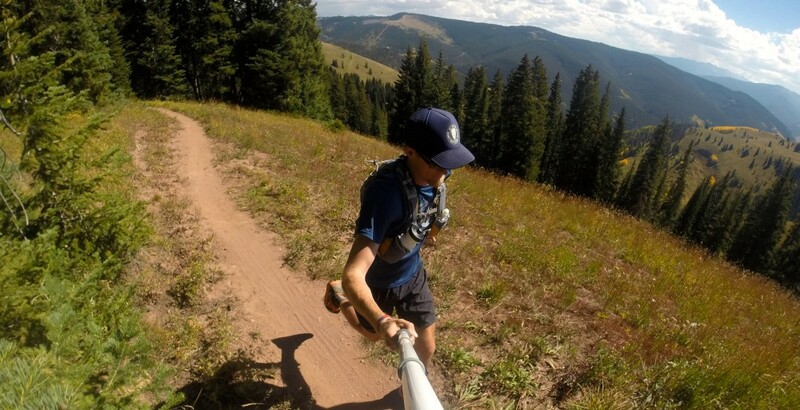 Looking forward to the chance to put it all out there over 31 miles of trail I have never run on before in Steamboat next saturday. Was up early for a loop on the north trail. Made some strong coffee with dark chocolate coconut milk the night before and had it ready in the fridge. 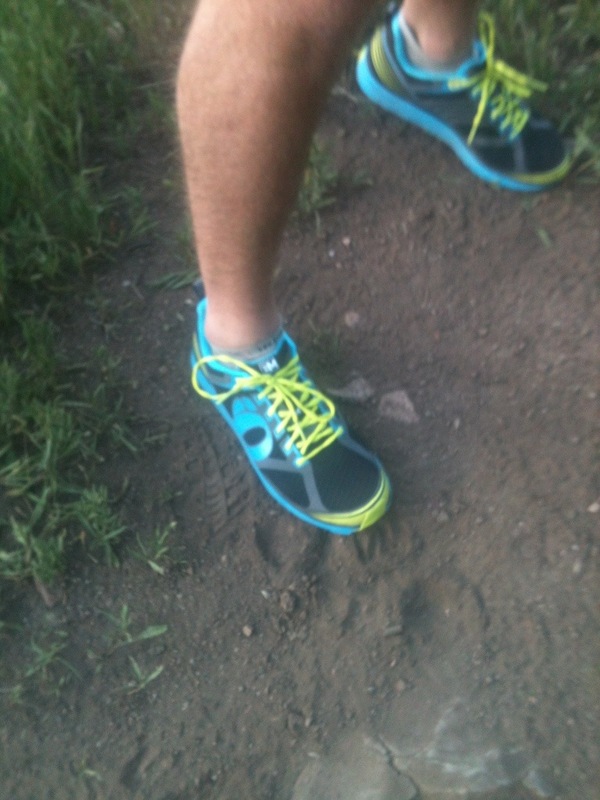 I just got a new pair of Pearl Izumi M2s so I was very stoked to try em out on some trail. First thoughts were they are super comfy and light with some good spring in the step. I was out the door around 6am and headed up the trail less than a mile from my door. It was really pretty as the sun came up over the mountains and there are still alot of wildflowers out, some sunflowerish looking yellow ones everywhere. 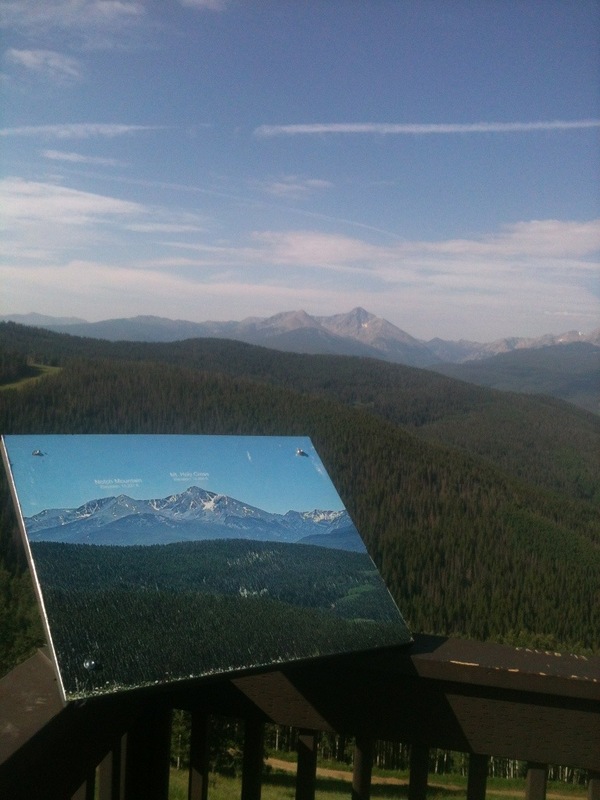 I brought Rooster with me and we were a little slow on the way up, stopping to take in the views and take some pics. From the top we cruised along the ridge through some aspens to the downhill moving along pretty good. 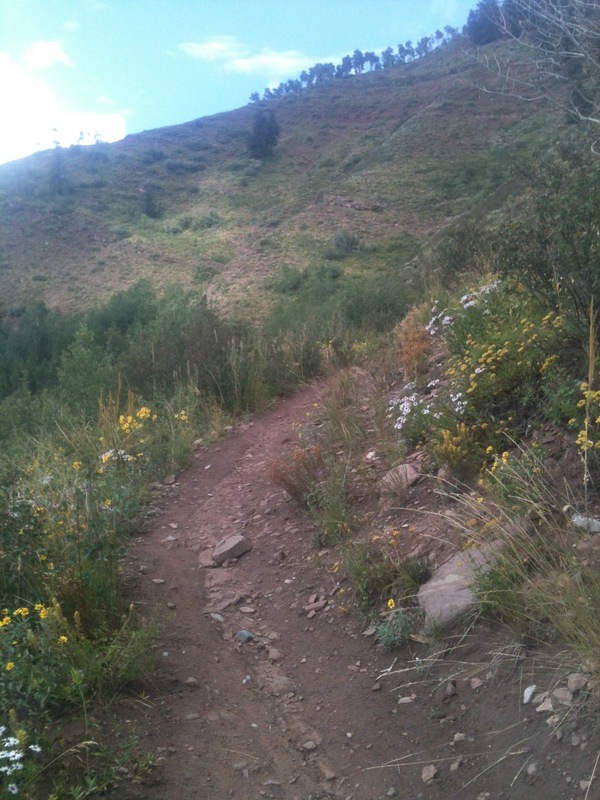 Feels good to get a run in before work especially on a nice trail section like this. The new shoes were amazingly comfortable and I cant wait to rock em out in MT Werner 50K. Tried to get a quick run in before heading to State Bridge for the night. Rooster and i were up early and out the door before 6am. 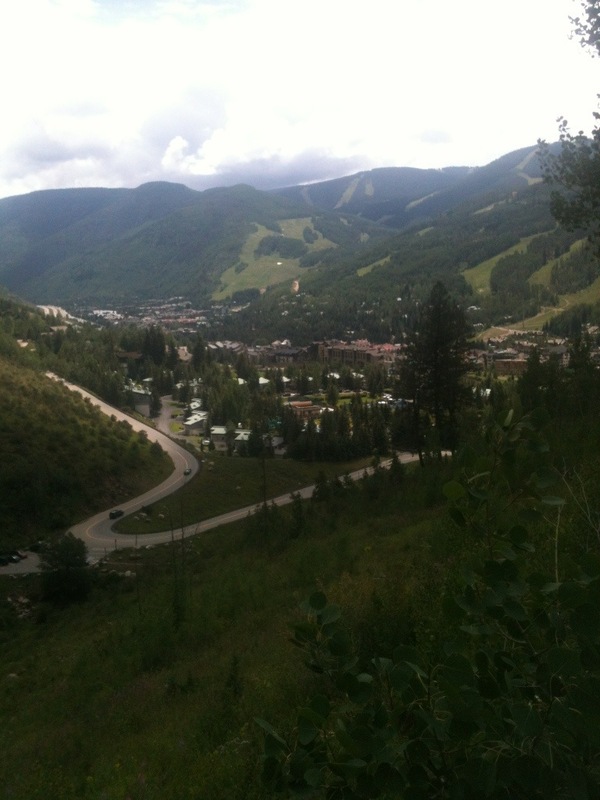 We just did a little loop going up the mountain then over towards West Vail, eventually getting onto the Bike Path along the river by Vail Cascade, looping around West Vail and crusing the roads back to Sandstone. It was nice getting out early but I was tired and have been trying to take it easy and taper. It was proably around an hour and almost my 7 miles i was going for. After the run, Madison and I headed to State Bridge to camp out and see the Motet. 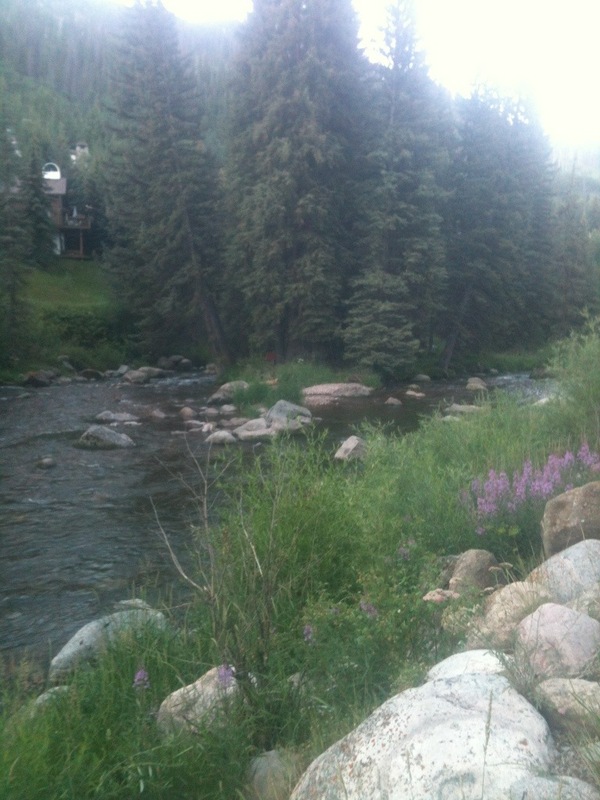 State Bridge is a beautiful area, lots of cactus and heat but its nice to be by the River. So tonight I went to this free Veggie Dinner I found in the paper. 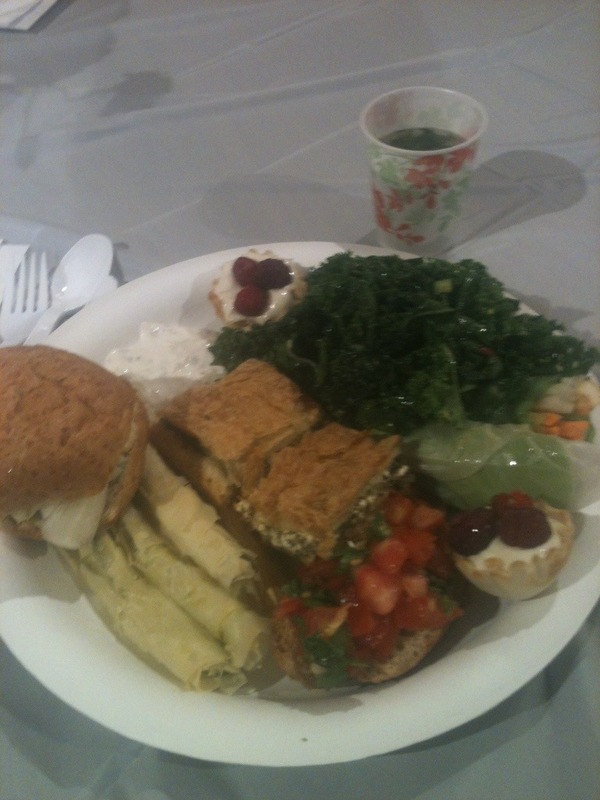 The food was AWESOME, all vegan and organic. Its been over 4 months since i started the plant power diet so this was great. It was put on by Eden Valley, some type of institute that treats cancer and other patients using only natural holistic means, and feeds them only vegan organic foods. Most of the veggies came strait from thier garden and let me tell you, this was the best Bruchetta I ever tasted. They had amazing sesame Kale salad, some tempora style asparagus, spinach puffs, dont call me a chicken salad sandwiches and spring rolls. I had a great meal then learned a little about the healing powers of charcoal. It had been raining lightening for a while but I really wanted to get out for a litle run. My training plan called for 7 miles but it was getting late so I just did a quick loop on the roads with the dog. I probably did around 3 miles in about a half hour. I felt good and it was nice to get out even it it wasnt long. 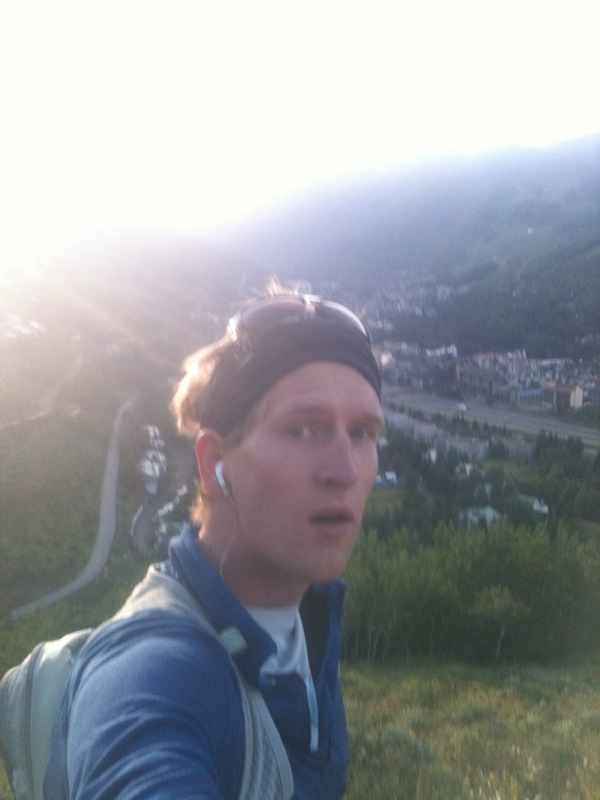 I have been wearing my old La Sportiva wildcats from my first marathon in breckenridge, which are still in great shape. I stopped wering them after the marathon because they are maybe a half size too small and give me blood blisters on the tips of my big toes if I go far in them. Anyways, it was a good healthy vegan organic meal and a quick little run to strech the legs out. Tapering is always tough for me, i just want to run as much as I can whenever I can. 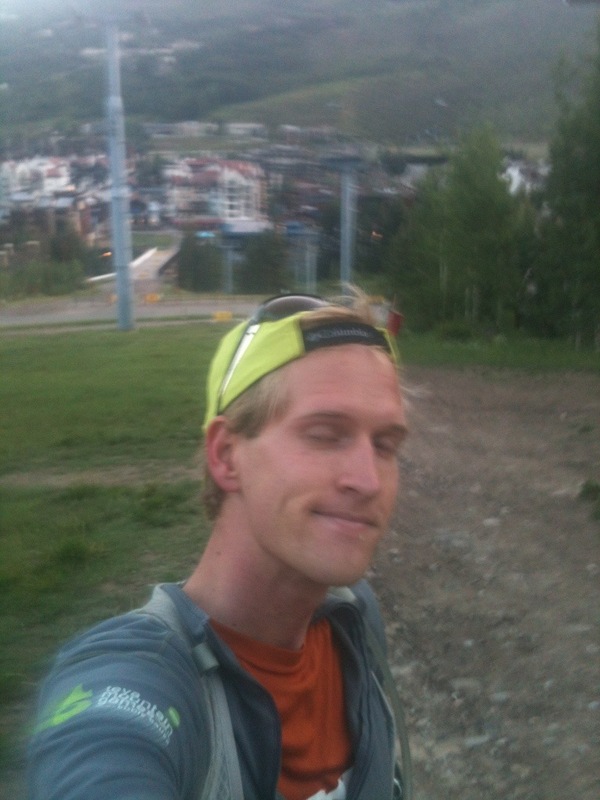 Saturday is two weeks till my first 50k race and I am getting stoked. Starting to get into taper mode for my first 50k on August 3rd. I tried to go out for a 16miler yesterday but right away was tripped by roosters leash and feel on the road, smashing my knee and hip. I tried to run it out but it didnt work and ended up hobbleing around the block and back to bed. 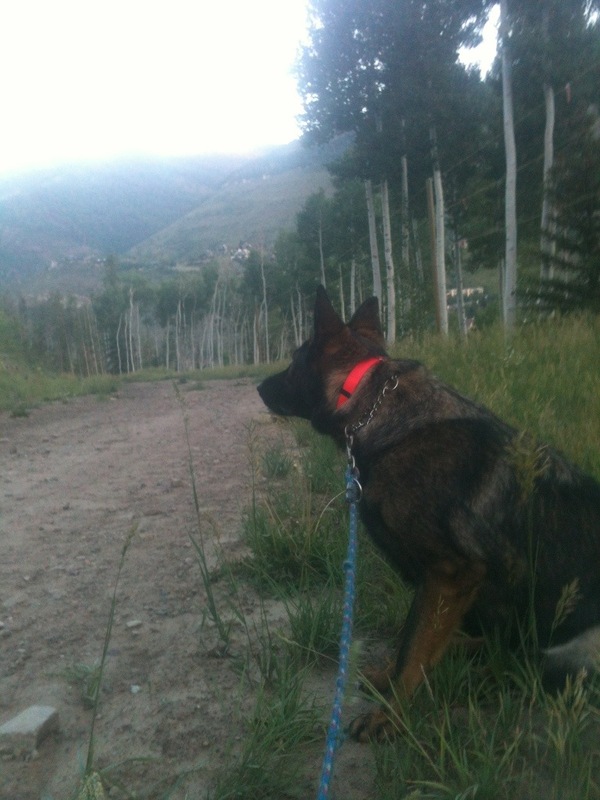 So i tried to make up for it tuesday and ran up berry picker with rooster.We got to the top and there wasnt any snow or water around for roo. I felt good but it was hot and i took the advice of an old lady and took the gondola down. Partly for roo and partly to save my legs. Roo was a little hesitant to get on so i picked him up but, once we were on, he was good and layed down to enjoy the ride. At the bottom we headed strait for the river, he jumped in and I found a good spot to lay down for a good dunk. I just go in shoes and all because its better traction on the slippery rocks, cleans the shoes, and its a pain trying to put your socks back on with wet feet. Went out for about an hour after work with the Rooster. Just went through Lionshead Village and up Berry Picker Trail a couple miles. Its a very steep trail so it was probably 2 miles up and 2 miles down with a mile or 2 thrown in going from my apartment in Sandstone to Lionshead and back. It was cloudy out and I was hoping for some rain, we got some sprinkles but not much. My shuffle headphones arnt working right so I went without music again and was glad I did. I took off my shirt and tucked it into my waist as soon as we got through the Village and onto the trails. 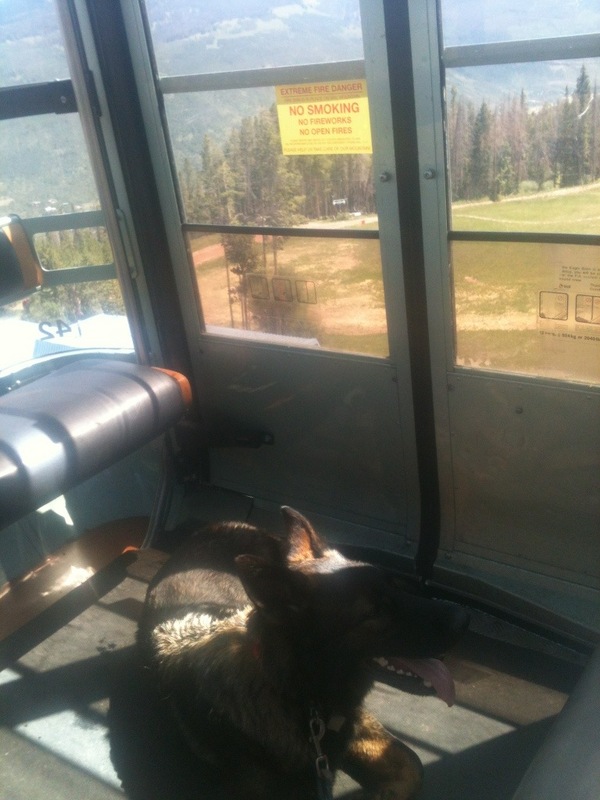 I did not see a single person on the mountain in the trails, only a few on the gondola above. I guess people think its bad weather but, after months of dryness I am happy for any precipitation. Felt great going up and fast going down. 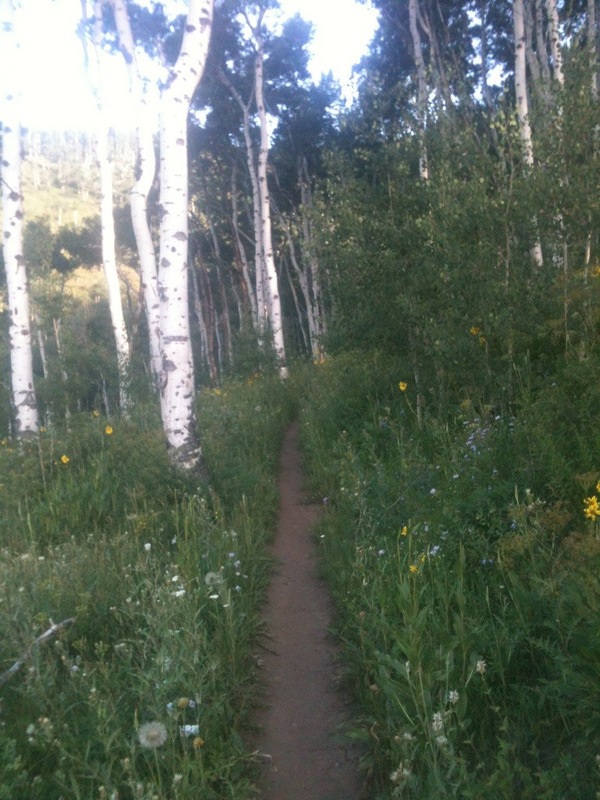 The trails were beautiful, very green and full of life, beautiful aspens as always. I always feel very lucky to live here but its during runs like this that I cant imagine living anywhere else. 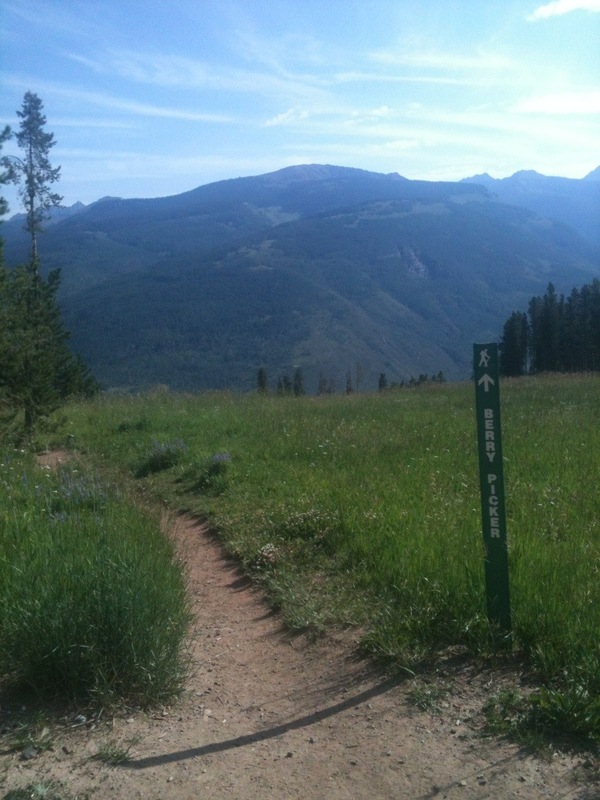 Another fast loop on the north trail after work. No shirt no music feels good. 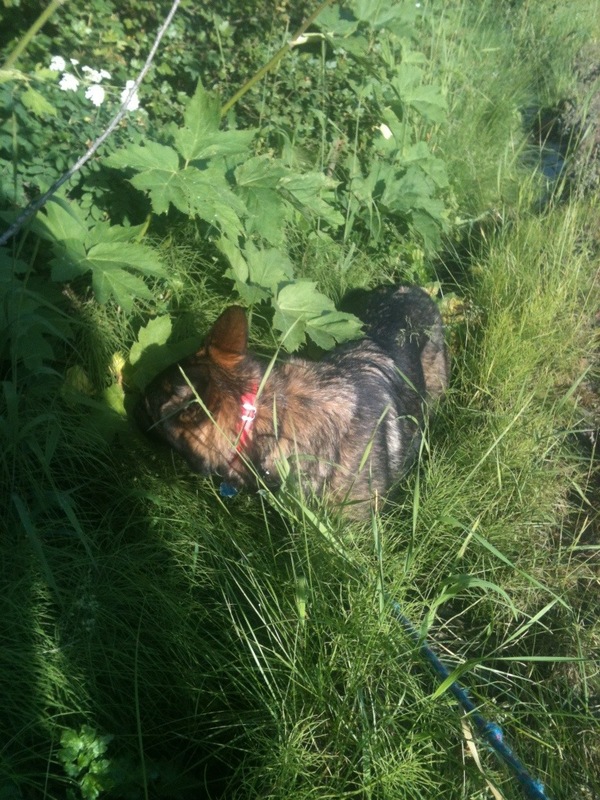 Planned to do a little farther but rooster wasn’t feeling good and I wanted to get home. Somewhere between 4-5miles. Felt good. 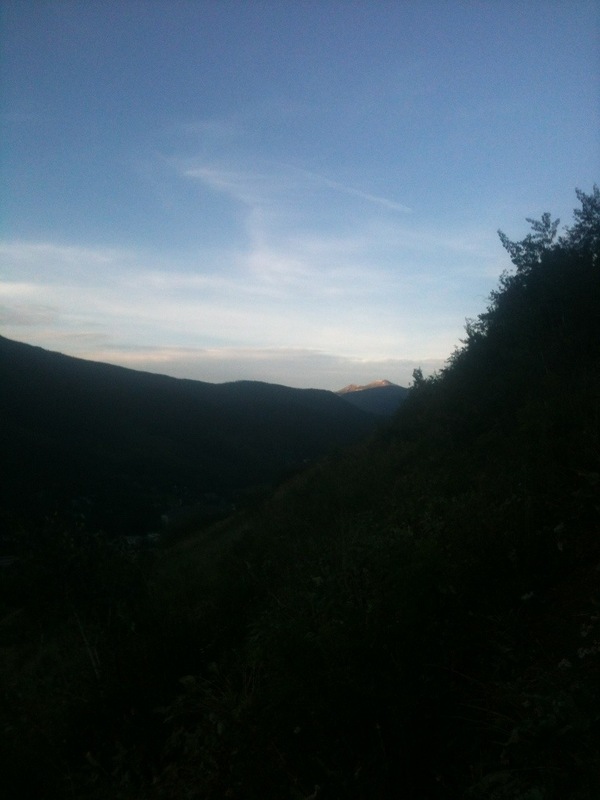 Great after work run on the north trail loop behind my neighborhood. 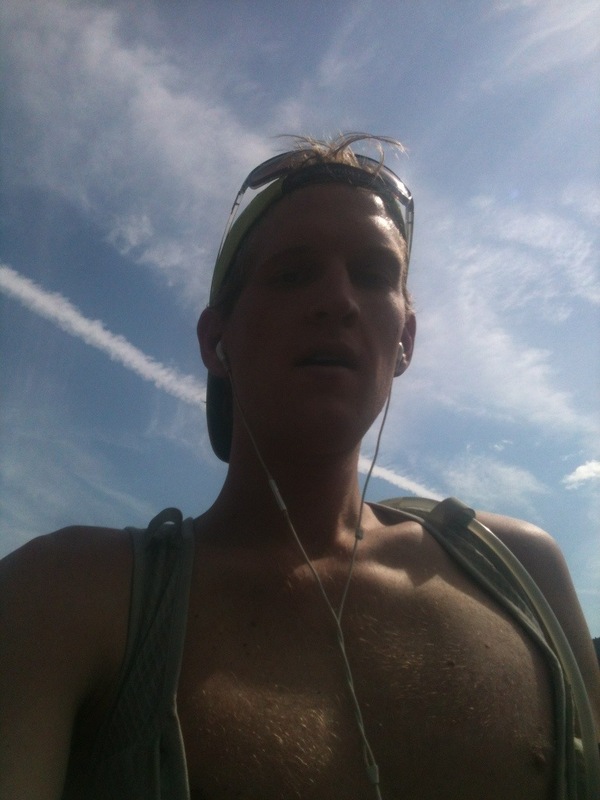 For running 25ish miles yesterday I felt great, I went no shirt, no music, no sunglasses. Just rooster, scarpa shoes, shorts and head buff. I put some MCT from twin labs in my UCAN for the first time and really felt great for this run. 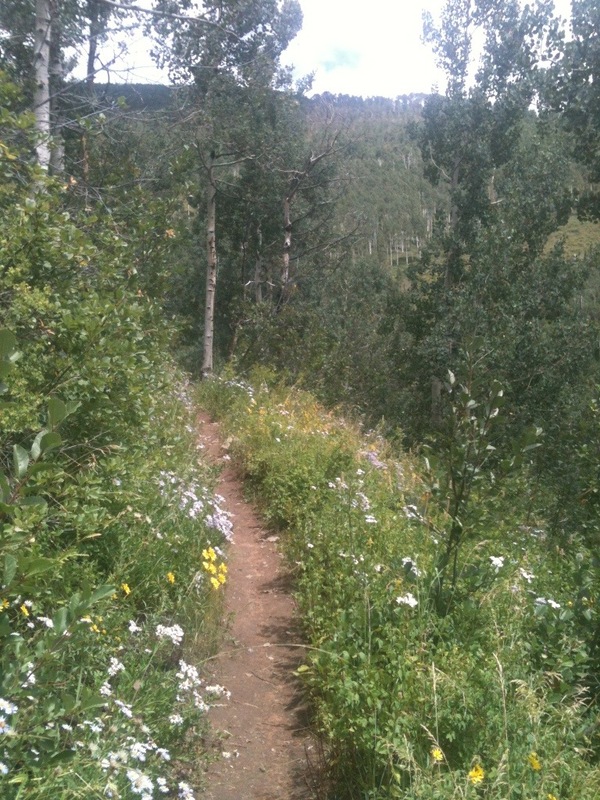 The north trail was beautiful as always and I saw a bunch of other hikers and runners on it. Madison and I went to the ale house after for some food and beers, I had some bomb Brussel sprouts and a bonfire vanilla porter and a Avery ipa. Life is good.